Everything was going great for Jack Glover, a 30-year old cop; until… it wasn’t. A single dreadful event is all it takes to turn your world upside down, and unfortunately for Jack, the evening of his fifth anniversary on the force was to be just that. During a routine investigation, mistakes were made. The kind you can’t fix, take back, or do much about, really. But then, some 40 years later, Jack receives a mysterious call, causing him to spring back into action – for The Last Time. But what can an old retired cop do about something that transpired several decades ago? Quite a lot, as it turns out, in this point ‘n click adventure! Helped by an unexpected source, a really bad attitude towards most things and a strong determination to at least try and set things right, it’s time to kick you-know-what and chew bubbleg– wait, no. It’s time to show the world that Jack Glover is still in his prime, bad guys be damned! This is done through a lovely minimalistic interface, free of inventory puzzles and confusing commands, favoring context-sensitive actions to keep a proper pacing without making the player feel like he/she is just along for the ride, as if guided by some invisible hand. Clicking an interactable object – indicated by on-screen text when hovering the cursor over something – pops up any and all actions currently possible. Much as I enjoy the likes of SCUMM, what with its multitude of verbs and at times rather amusing responses to attempts at impossible actions, what The Last Time does is certainly not bad at all, having at most three actions (examine, interact, use item on/with) to choose from. Players won’t be carrying around an obscene amount of items either, somehow magically fitting it all into multi-dimensional pockets (ah, how I wish those were a thing). In fact, I recall Jack often downright refusing to grab something unless it seemed immediately useful. Whether this is simply a case of laziness or him being more clever than he ever lets on, I do not know, but it did bring about some slightly comical scenes. One such in particular involved a used handkerchief, and… well, yeah. That’s not to say The Last Time is built around lightheartedness however, because it most certainly isn’t. Not in the slightest. Actually, it does feature some rather dark humor, but that’s about the extent of it. For the most part, the hour or so I spent playing through the story, seemed more akin to a grim tale. One of revenge. One about holding a grudge, as it were, for much too long. One with a really weird ending – that I shall not spoil here – but I’m getting ahead of myself as usual. In a way, given the amount of choice-driven dialogue compared to how little you’re actually moving Jack around various locales, I couldn’t help but feel like I was playing a visual novel/point ‘n click adventure hybrid. An intriguing one, sure, but still a genre entry leaning more towards the former, compared to most other. At least it looked good from start to finish though, was well-written (in spite of a typo or two) and the whole choice-and-consequence did help me feel engaged, part of the story, more so than usual. Another way in which it differs from other similar titles, and thank goodness for that as I would likely have been significantly less interested in the whole thing without some sort of interaction during all that dialogue. Heck, the developer even included actions/responses that really surprised me! Things like… letting Jack speak his mind at the most inopportune moments, perhaps even getting a bit rough with the wrong people, and making decisions that had geninely heartfelt consequences; almost immediately, at times. 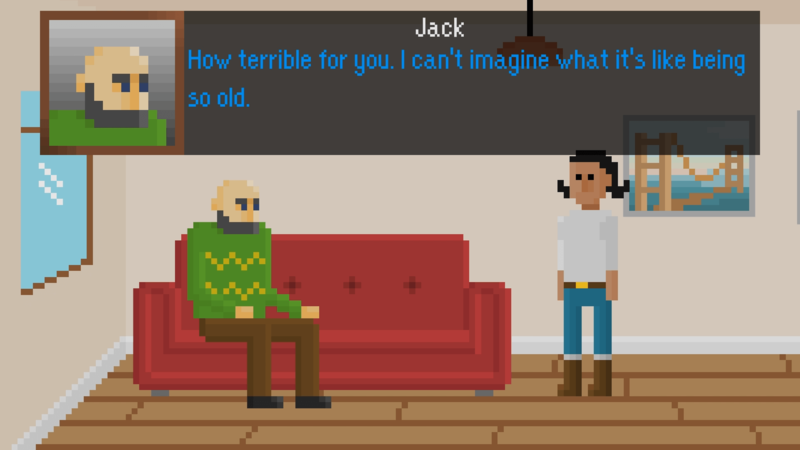 While this non-linear gameplay doesn’t lead to multiple endings, far as I can tell, it does help make the player’s role as Jack more believable in this little senior citizen detective tale. Just what someone his age is doing running around trying to solve a mystery best left to the authorities is beyond me, but eh, it made for a really good video game, so let’s throw logic out the window just this once. Now, while I did mention how The Last Time featured more than a fair bit of dark humor, it’s also a rather gory and/or gruesome experience at that, pixelated art style and all. Throughout the game, you’ll face decisions that will leave a lasting mark on the world, remaining long after the story concludes and the credits have faded. Or… simply pick something else. 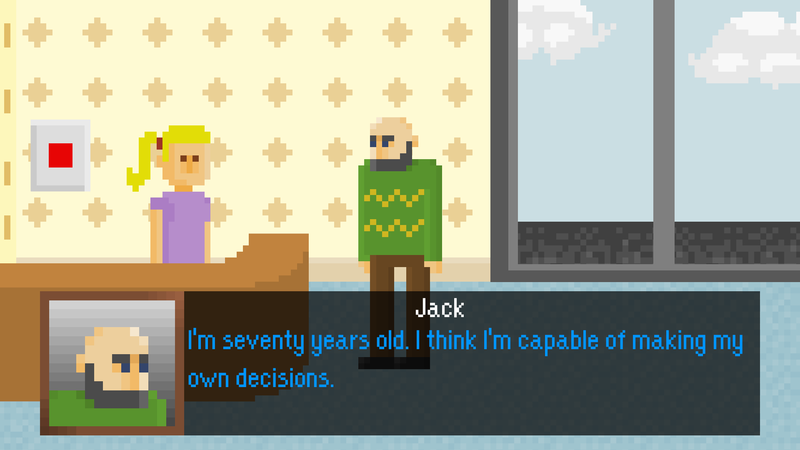 Jack is, for the most part, given at least three or four options during branching dialogue sequences, so whether you choose to portray him as a good guy or someone who’s done taking crap from anyone, well, that’s entirely up to you. Suffice to say, I went with the latter, because where’s the fun in acting all nice and clean in a scenario like this? 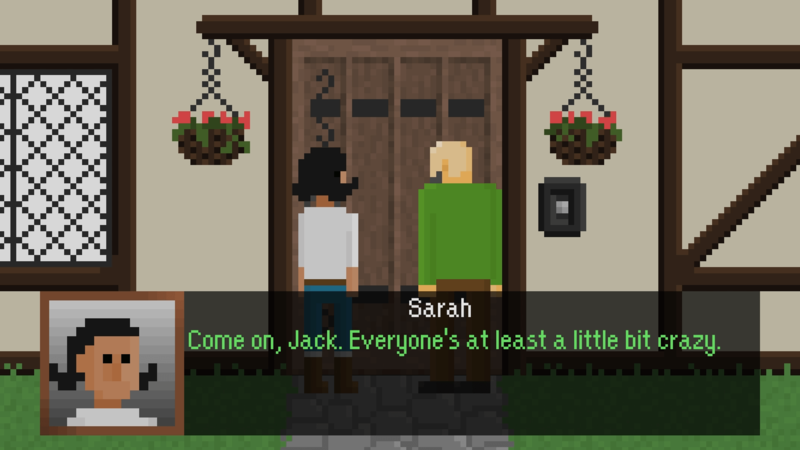 From one locale to another, little by little, Jack’s tale is told. It’s not a happy one, nor is it a journey he would have wanted to embark on, given the choice, I’m sure. But we all have to face our demons at some point, and this is his time for just that. Still not entirely sold on the ending, although pending key choices, I don’t see how the story could have wrapped everything up any differently. As such, all in all, The Last Time is an easy recommendation. Even more so if you’re a fan of pixel art, point ‘n click adventures, dark mysteries, or a mix of the lot, because this game blends all those elements together quite nicely. Its relatively short length – clocking in at little over an hour – might be off-putting for some, but anything longer would run the risk of pointless filler. Besides, it’s not often you get a well-written story with old-school visuals like this one for less than five bucks. 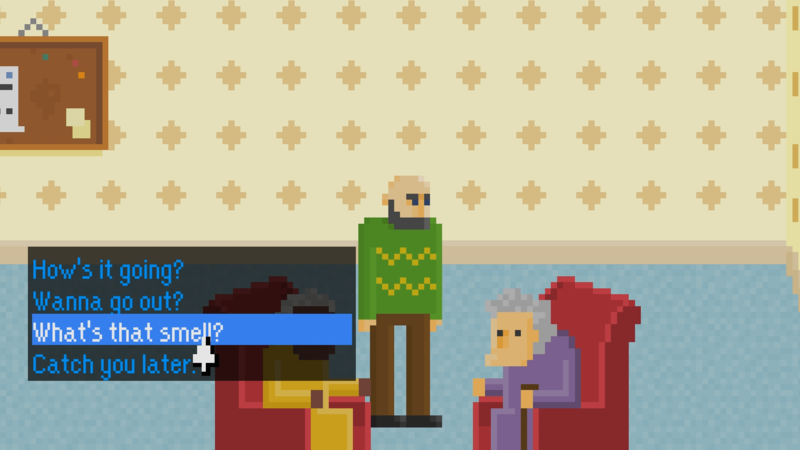 The Last Time is available on Steam, carrying a $3.99 price tag.